The Raised Tail is part of the Arabian constellation of the Scorpion (al-‘aqrab). The Arabian Scorpion followed the image of the scorpion defined by the Sumerians more than 3000 years ago. The Raised Tail marks the end of the Scorpion’s tail, which has been curved and raised to strike. 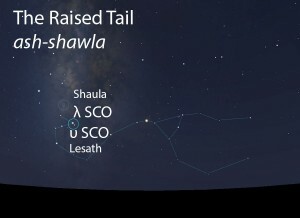 The Raised Tail (ash-shawla) of the Scorpion (al-‘aqrab) as it appears in the west about 45 minutes before sunrise in mid-May. Sky simulations made with Stellarium. A pair of bright stars located very close to each other at the end of the tail of the Scorpion. The Raised Tail of the Scorpion does not figure in the calendar of the rains stars. In early listings of the lunar stations, the Raised Tail is the 21st station of the year. This was later changed to the 19th lunar station after the stations were adjusted to begin with the vernal equinox. 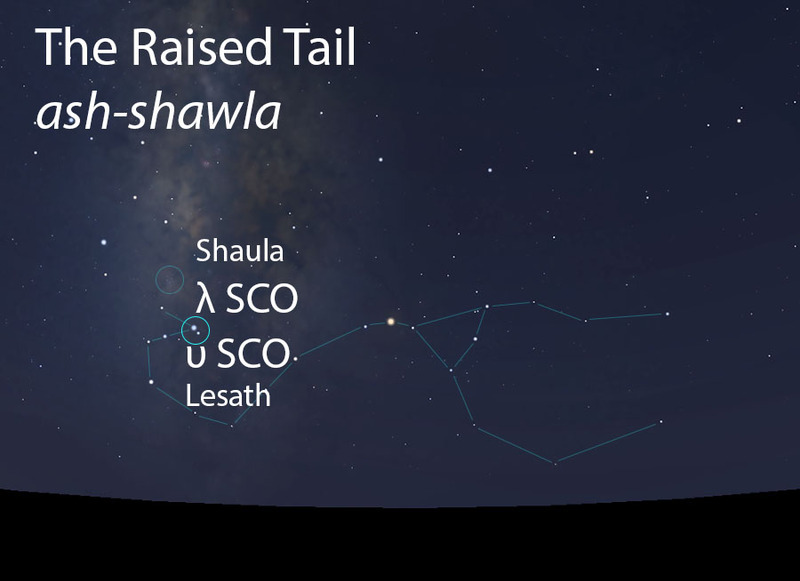 The stars of the Raised Tail partially match the Hindu nakshatra called Mula. The Raised Tail is part of the Scorpion (al-‘aqrab, العقرب) folkloric celestial complex, which extends from the Two Claws (az-zubanayan, الزبانيان) to this Raised Tail.